Smiles Make the Greatest Gifts. Brighten the holidays for a struggling neighbor. 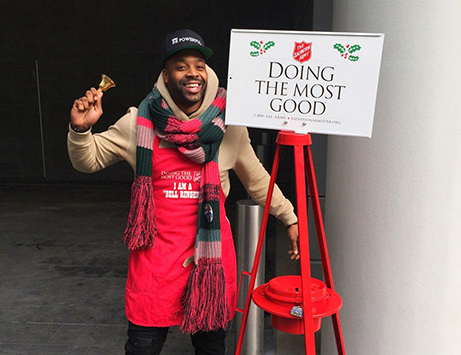 Join LaRoyce Hawkins and The Salvation Army in the Fight for Good! LaRoyce Hawkins - you know him from his role as Officer Kevin Atwater on Chicago P.D. - is Harvey, Illinois' very own home-grown actor. This year, his greatest role is as Salvation Army Celebrity Kettle Ambassador. He's partnered with the Army to bring awareness and support for our services supporting neighbors in need. As Kettle Ambassador this season, LaRoyce will also be donning a volunteer apron and ringing a bell at an iconic red kettle on Thursday, December 20th from 12 - 2pm, at Macy's, 111 N. State Street, Chicago, IL 60602. You can make a donation to his online fundaiser now through January 31st! Millions of American parents cannot afford to buy their kids Christmas presents. 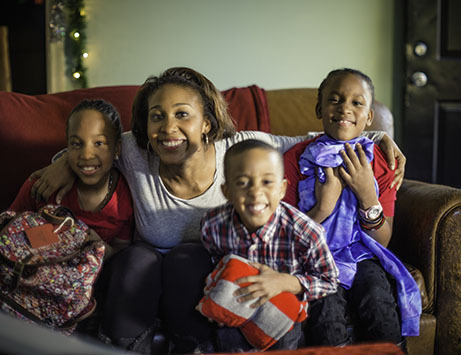 The holidays bring added financial and emotional stress to families living in poverty. The Salvation Army's mission shines brightest at Christmastime. The Salvation Army celebrates Christmas by spreading hope, love and joy to the less fortunate members of society. As families gather together to count their blessings, they wish each other glad tidings and experience children's unbridled happiness. From physical needs such as grocery, utility and gift assistance, to emotional experiences including holiday events and traditions, to spiritual guidance that provides healing and hope, The Salvation Army works to assist the whole person through gifts that serve the body, mind and soul. Make Christmas Merry. You can help. These iconic red kettles signal the start of the holiday season. Donations collected in these buckets support the services in your neighborhood. Bell ringers are both seasonal employees and volunteers. Learn more about Bell Ringing. When you're struggling financially to care for your family, holiday gifts are often not feasible. The Salvation Army Angel Tree program allows donors to purchase gifts and clothes for families in need, making their holidays brighter. Be an angel for a family in need this Christmas. The Salvation Army partners with the Chicago Bears and Jewel-Osco and NBC5 to collect new or gently used winter coats for families. Each year, we collect more than 30,000 coats. The Salvation Army provides holiday meals for families unable to create a special meal themselves. Each box feeds a family of six, and includes meat, potatoes, stuffing, vegetables, biscuits, cake mix and more. Several community centers also host holiday meals at their locations. You can brighten the holidays with the Christmas Food Box Project. Share these facts with your friends and followers! Advocate with us to create real change. The Salvation Army provides special holiday meals for more than 19,000 families each year. When you donate to The Salvation Army, you help provide a special holiday meal for a family in need.Donate now. When you volunteer to ring a bell for two hours, your efforts can feed a family of four. Volunteer as a bellringer at a red kettle this holiday season and make a difference with just a flick of your wrist and a smile. for a child in need. The Salvation Army Metropolitan Division distributes more than 250,000 toys, gifts and clothing during the holiday season. Be an Angel Tree Donor and make Christmas brighter. Sign Up today. Is this your first time ringing bells at The Salvation Army's iconic red kettles? Or, maybe you'd like a quick refresher on best practices? Check out the video below for some bell ringing tips.